Hitchcock bench with Gold Harvest tone stenciling. Maple wood and black finish with gold tone acccents. Beautiful 1950's Deacons's Bench.Must See to appreciate in better lighting. Seat height 17.5 arm height 25.25. super quality. great shape. minor wear. Not available in all states. this will require you to pick up at the local greyhound station. We try to fully describe each piece in an attempt to let you know exactly what you will be receiving. 37"L X 34"T X 20"D. (SEE PICS). Normal age wear consistentwith age, such as light scuffs on legs and seating area. Seat: 17″ High. We are happy to work around your schedule but be aware that this could result in a delay in receiving your order. In all cases, we will do everything we can to get your order to you as soon as possible. Features a high paneled back with carved heart and wing back style arms. See Pictures. FREE Trial! (L x W x H). The pews are being sold individually. Each pew is just over 12 feet long and includes kneelers which mount behind with hinges along the floor allowing them to flip up and out of the way. These were set in line in the church with the carvings facing inwards along the aisle. Primitive Deacon Beach with rail back splats with curved sides and rounded side arms and bench seat. Painted red with black paint underneath. Condition Report: Good Condition, wear to paint as expected with primitive benches, shows the underneath black paint, unique bench. 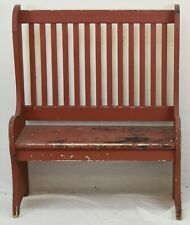 Vintage Authentic Hitchcock Deacon's Bench Arrowback Original Condition. L. Hitchcock. Hitchcocks-ville. Conn. Warranted. Solid and study. Shows signs of wear but never refinished or touched up. Local pick up in north New Jersey, or will deliver local. 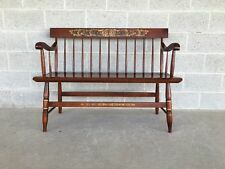 Original L. Hitchcock Deacons Bench. Maple Harvest Dark green Hand stenciled floral Decoration. For your consideration – lovely antique oak Deacon's bench of unknown manufacturer. Previously from a church in Brooklyn (Our Lady of Consolation) NY. The bench has a beautiful design and quality. Check out the carving on the back panel. Item size is 33" High x 36" x 20" Deep. 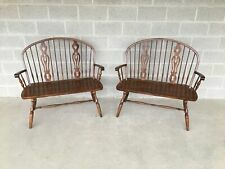 Ethan Allen Old Tavern Antiqued Pine Deacon's Bench 12 6025. Old Tavern Antiqued Distressed finish number 212 on Pine. EARTHJUNK - USA's Largest Dealer of Used Ethan Allen. As typical, the most wear is on the seat. **Price Reduced** 6-FT LONG EARLY AMERICAN-STYLE MAPLE DEACONS BENCH, VERY NICE! Farmhouse Classic • Cottage Decor • Rustic Ranch!!! The Deacon's Bench Is in nice used condition and has light use. One owner this Deacon's Bench was bought new in 1972. Not sure is the cushion covering is original. NICHOLS & STONE Hitchcock Style Maple Bench / Deacons Bench. It has some signs of wear but is in nice condition overall. Due to its size I would prefer local pickup. If you want it shipped I can stap it to a pallet and deliver it to YRC Freight for you as long as you pay the freight charge.